The marbled cat possesses an unusual mixture of small and big cat characteristics. Although just three kilograms and about the size of a domestic cat, this species superficially resembles the much larger clouded leopard in its broad feet, enlarged canines and strikingly similar, blotched coat pattern. The thick, soft, brownish-yellow fur is covered on the back and sides in large, mottled, irregular-shaped blotches margined with black. 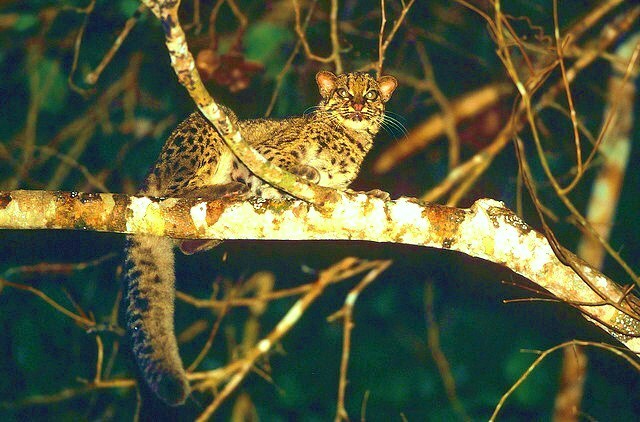 However, these markings are less well-defined in the marbled cat than those of its larger cousin, tending to be more broken and marbled (hence the name), while the black spots on the limbs are more numerous. The bushy tail is extremely long, reflecting the cat’s arboreal lifestyle, and similarly marked with black spots and rings. Prominent black lines occur on the head, neck and back, starting as dark, interrupted bands running from the corner of each eye up and over the forehead. Distinctive dark stripes also mark the cheeks, while the chin, upper lip, cheeks and patches around the eyes are contrastingly white or buff in colour. The eyes are amber or golden, and the ears are short, rounded and black, with a conspicuous white to buff spot on the back.